IN Touch Books and Magazines is a bookstore in Koramangala that has shelves packed with brand new books and magazines in all genres and niches for book-lovers of all ages. 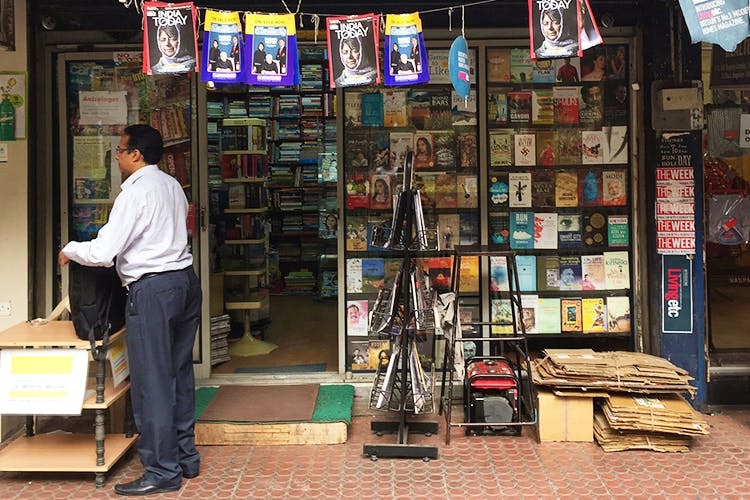 Started 25 years ago by avid reader Harindra Savanur, IN Touch Books and Magazines is a cozy little store on Koramangala’s BDA Complex. Packed with as many books and magazines as the place can hold, the bookstore offers something for everyone from picture books and illustrated encyclopaedias for the little ones to fiction and non-fiction books in every genre to mystery and astrology for adults. Find popular paperbacks by John Grisham and Jeffrey Archer, and even copies of Amar Chitra Katha, which gave us a sweet nostalgia trip. For all you hopeless romantics, the store has an entire stand devoted just to Mills & Boon. Their equally extensive collection of magazines has everything from The Week and Business Today to Better Homes and Gardens and ART India on their stands. And all the literature here isn’t restricted to just English. You'll find some regional texts here in Kannada as well. The books here start at a humble INR 10 and go up to INR 25,000. Harindra has been in the book game for so long that he has developed a close relationship with his growing clientele. Some of the big names that visit his store and rely on his suggestions include the likes of Narayana Murthy and Nandan Nilekani. IN Touch also puts up exhibitions at colleges like Symbiosis and carry a bunch of text books and other reference texts in the store as well.